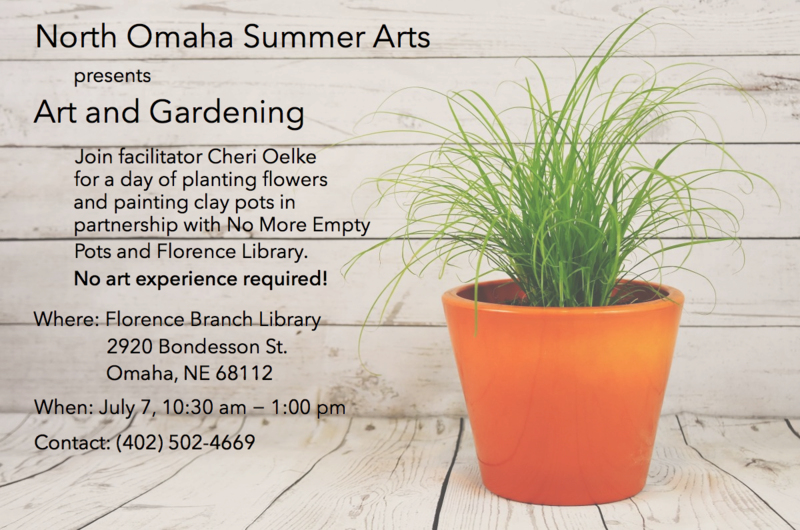 North Omaha Summer Arts continues its FREE community, family-friendly festival with an Art and Gardening event on July 18. More events through mid-August. Read more below and watch for weekly updates and announcements here. North Omaha Summer Arts (NOSA) celebrates 5 years. Come be a part of this FREE community festival for the whole family!! 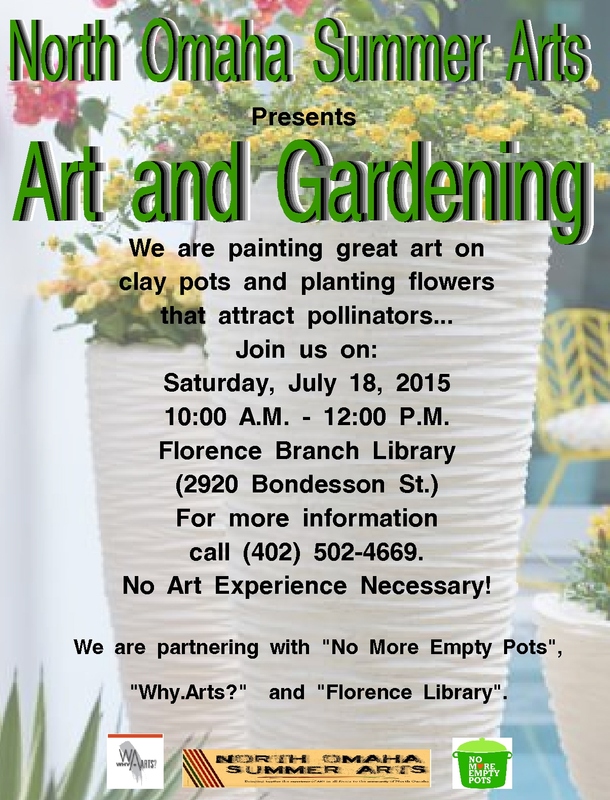 Join NOSA, No More Empty Pots & WhyArts @ Florence Branch Library making art on clay pots and planting flowers that attract pollinators. Pots provided but bring your own pots if you like. Call 402-502-4669 to register but registration not required. Youth participants from Project Everlast, YouthLinks and Solomon Girls will collaborate with Heartland Family Service Senior Center residemts to create a mobile mural with the theme of Peace in North Omaha. Participants will work under the supervision of muralist and sculptor Pamela Hinson at the HFS Intergenerational Campus. The mural will have its first public showing at the NOSA Arts Crawl on August 14. Featuring work by established and emerging artists.Take a stroll or a drive down North 30th Street from Metropolitan College Fort Omaha campus north to various churches to Heartland Family Service/Solomon Girls Center. NEW THIS YEAR: The Washington Branch Library, 2868 Ames Ave. is hosting an Arts Crawl reception from 5:30-6:30 p.m. Enjoy art and refreshments at the library. Remember all NOSA activities are FREE and open to the public.